Built by the Arjun Pal, founder of Karauli in 14th century, now cty palace only has some remains. The structure which one can see in the name of city palace was erected by Rajas Gopal Singh in the 18th century. 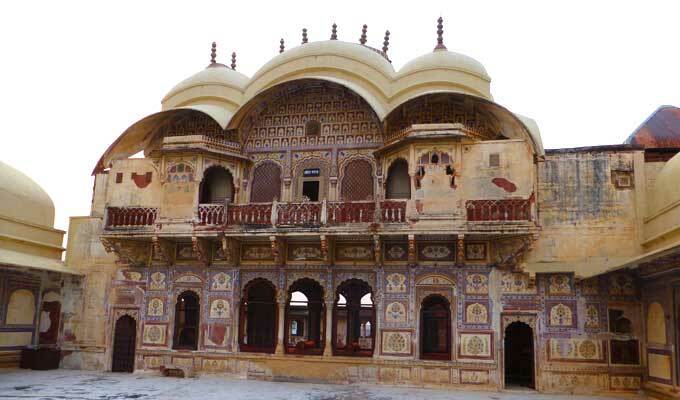 City Palace of Karauli has many colors as red, white and off-white stone were used in its construction and painted with bright colors. From the terrace one can see the spectacular view of the city. Pathways and stairways are also very amazing to walk over them. City Palace of Karauli is a 14ht century Palace which was built with amazing architectural stuffs like beautiful sculptures and stucco work. It was the royal residence of the royal family of Karauli till 1938 when the family shifted to the Bhanwar Vilas Palace. Diwan-i-Aam‘ has the attractive work on the walls with floral patterns colored with bright colors. Used by the king to met his subjects and discuss important work, this hall’s upper floor has marvellous jaali work on the walls from where Ranis could watch over the proceedings of the hall. Another hall – Rang Mahal known for its magnificent cloured glass ‘Jharokhas’ and mirror theme spreads from hall, walls to bedrooms. ‘Barahdwari’ – a hall for women dancing purpose has line of portraits of the Kings. City Palace was gifted to the Madan Mohan Trust ( the sole trustee of which was Raja of Karauli) in order to avoid taxes. Now restoration of palace is going on. By Road: City Palace is located in the main bazaar of Karauli city. One can easily reach here by local bus or local taxi, rickshaw or by walk. By Rail: City Palace is well connected through nearest Hindaun City Railway station ( 35 km) to major cities railway stations like Delhi, Agra, Mumbai, Chennai, Ajmer, Pali, Jaipur, Ahmedabad. By Air: City Palace can be reach through nearest Jaipur Airport (161 Km) which is well connected with regular domestic flights to Delhi, Mumbai.